Senior Fellows Karen Coates and Jerry Redfern report primarily from Southeast Asia, working as a print and photojournalist team on issues involving the environment, health, and human rights. 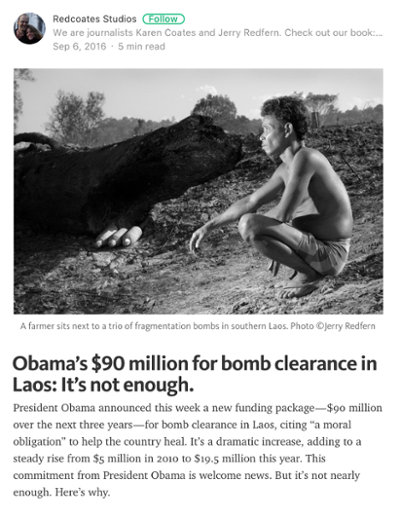 In 2013, ThingsAsian Press published their two books, "Eternal Harvest: The Legacy of American Bombs in Laos" and "This Way More Better." Coates, a former correspondent for Gourmet, was a 2010-2011 Ted Scripps Fellow in Environmental Journalism at the University of Colorado, Boulder, where she focused on food security issues. Science journalist and Schuster Institute Senior Fellow Maryn McKenna specializes in reporting about public health, global health and food policy. She is a frequent contributor to National Geographic and helped jumpstart their award-winning website The Plate, a discussion on food policy. McKenna closely follows the story of antibiotic use in agriculture and the rise of drug-resistant bacteria. Her 2015 TED Talk on antibiotics has been viewed over 1.4 million times. Her new book, "Big Chicken," will be released by National Geographic in September. Senior Fellows Karen Coates and Jerry Redfern have dedicated more than a decade to reporting on issues of environmental justice in Africa and Southeast Asia, which includes public health and human rights. Their reporting connects the economies and societies of that part of the world to the West, telling the stories of people there affected by globalization and foreign policy. Coates and Redfern reported primarily from Southeast Asia, working as a print and photojournalist team on issues involving the environment, health, and human rights. In 2013, ThingsAsian Press published their two books, "Eternal Harvest: The Legacy of American Bombs in Laos" and "This Way More Better." 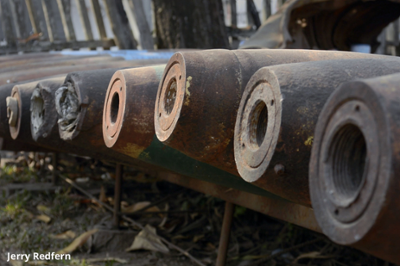 Read Coates and Redfern’s full report on The Legacy of Unexploded U.S. Bombs in Laos. "Bombscapes: Of War and Earth," Karen Coates and Jerry Redfern, Undark, Sept. 20, 2016. 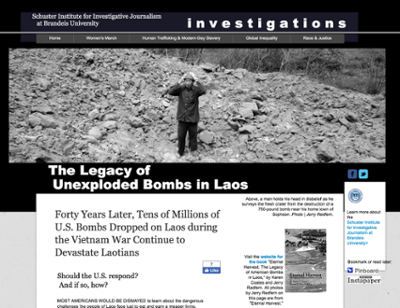 In this article and video, Coates and Redfern explain the ongoing impact of 2.5 million pounds of bombs dropped in Laos by the U.S. for eight years starting in 1965. Redfern was also awarded Society for Environmental Journalists’ grant to film a documentary in Laos based on his and Coates' work for Eternal Harvest. 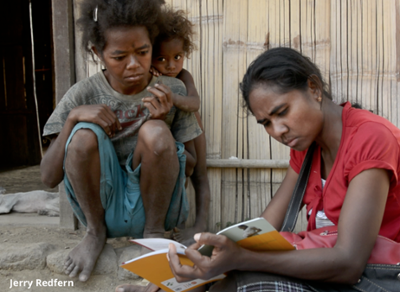 In 2016, Redfern and Coates reported on "food security, hunger and healthcare" in East Timor with the international Reporting Project grant. In 2015, Senior Fellow Karen Coates was named a Connect Fellow with the International Women's Media Foundation African Great Lakes Reporting Initiative. 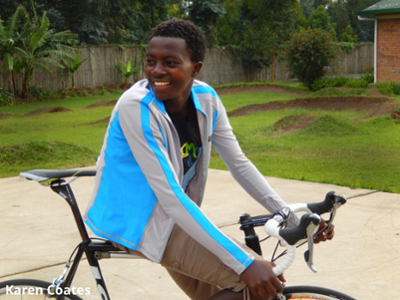 She used the fellowship to continue her reporting on food security, health and development in Africa. "The Myth of the Virgin Rainforest," Karen Coates, Discover Magazine, May 6, 2016 Evidence of humans managing the rainforests to grow food in Malaysian Borneo goes back centuries further than scientists previously thought, Coates reports. "State Lawmakers Are Upping the Ante on Renewable Energy," Jerry Redfern, Seeker, Feb. 28, 2017. Juxtaposing climate change programs and policy in California, Massachusetts and Nevada with Trump administration moves to roll back Obama programs. "To Keep You Is No Benefit. To Destroy You Is No Loss,” Karen Coates, Dame Magazine, April 13, 2015. "The Global Land Grab: Rich countries are buying up poor countries,” Karen Coates and Jerry Redfern, Slate, April 25, 2014. Read more of Coates’ and Redfern’s works on their website . Senior Fellow ﻿Maryn McKenna reports on public health and the cross-section between the environment, climate change, and our health. 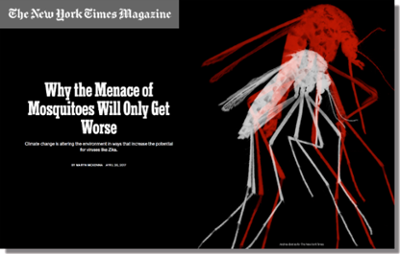 "Why the Menace of Mosquitoes Will Only Get Worse,” Maryn McKenna, The New York Times Magazine, April 20, 2017. McKenna explores the impact of climate change on the spread of Zika and other mosquito-borne viruses in the U.S.
"Revived Climate Change Forum Focuses On Threats to Human Health,” Maryn McKenna, Eos, Feb. 17, 2017.